Farrar, Straus and Giroux, 9780374279837, 432pp. Karl Ove Knausgaard is sitting at home in Skåne with his wife, four small children, and dog. He is watching soccer on TV and falls asleep in front of the set. He likes 0-0 draws, cigarettes, coffee, and Argentina. Fredrik Ekelund is away, in Brazil, where he plays soccer on the beach and watches matches with others. Ekelund loves games that end up 4-3 and teams that play beautiful soccer. He likes caipirinhas and Brazil. 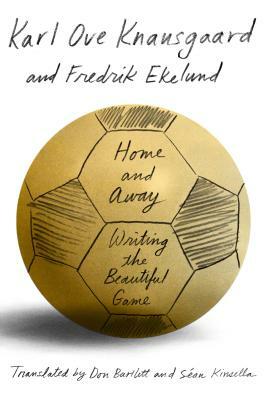 Home and Away is an unusual soccer book, in which the two authors use soccer and the World Cup in Brazil as the arena for reflections on life and death, art and politics, class and literature. What does it mean to be at home in a globalized world? This exchange of letters opens up new vistas and gives us stories from the lives of two creative writers. We get under their skin and gain insight into their relationships with modern times and soccer’s place in their lives, the significance the game has for people in general, and the question Was this the best soccer championship ever? Fredrik Ekelund was born in Sweden in 1953. He published his first book, Stuv Malmö, in 1984, and has since published another dozen works—novels, detective novels, collections of poetry, and books about soccer. Ekelund is also a playwright, and has made two films (with documentary filmmaker Lars Westman), as well as working as a translator specializing in Danish, Spanish, Portuguese, and French. Seán Kinsella was born in Ireland and holds an MPhil in literary translation from Trinity College, Dublin. He lives in Norway with his family. He is the translator of Two Sisters and Home and Away.